I participated in this 5K last year for the first time. I ran in support of my friend, Jess, with her 80’s themed team, Jessie’s Girl’s (and Guys). My 80’s attire featured a bright pink t-shirt with the words “HOPE, STRENGTH, FIGHT”. Unbeknownst to me, this would become my mantra 6 months later. 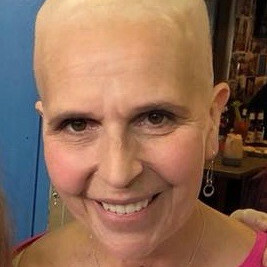 On November 17th 2017, I was diagnosed with breast cancer - stage 2 Invasive Ductal Carcinoma. Since that date, I have undergone 17 weeks of chemotherapy. Later this month, I will have a lumpectomy. After that, I will undergo 30 treatments of radiation. Throughout this journey the support of family, friends both near and far, and medical professionals has been beyond amazing. I am truly blessed to be part of such a caring community! All proceeds from the DE-feet Breast Cancer 5K Run/Walk will benefit the Delaware Breast Cancer Coalition programs. Please consider making a donation to my page and/or joining my team, "Rox Socks It To Breast Cancer" to participate.